Above: The Crown Grill on Grand Princess. Above: A lobster cake starter. Below: Sea scallops wrapped in bacon. Above: Black and Blue Soup. Above: The potato side dishes. Below: The vegetable side dishes. 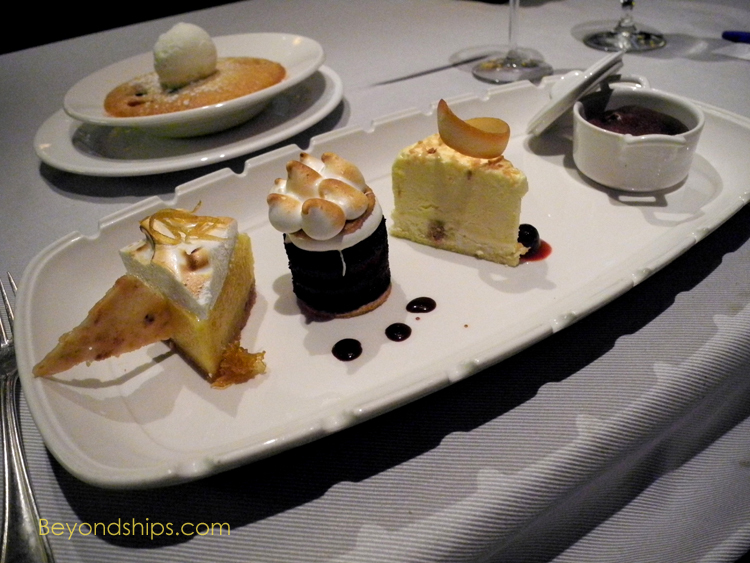 Above: The Crown Grill dessert sampler. Below: The Wild Berry and Apple Cobbler. 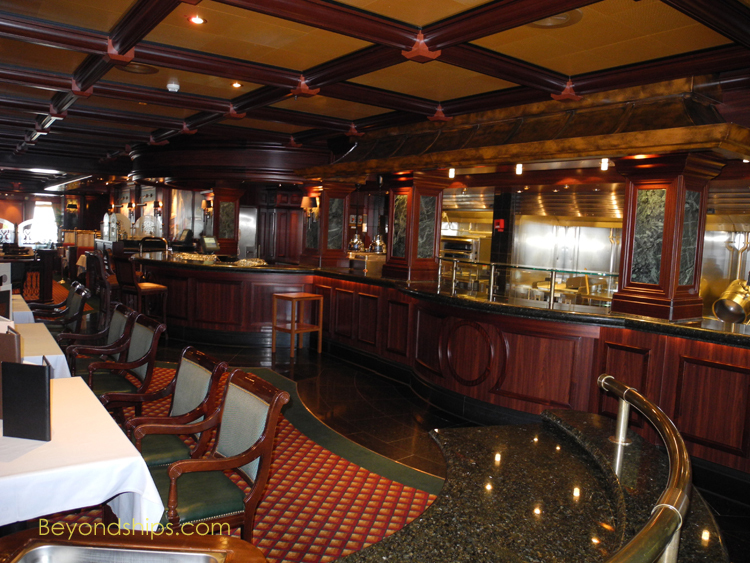 Above and below: The Crown Grill on Crown Princess. The Crown Grill debuted on the Crown Princess when that ship entered service in 2006. It was so successful that Princess included it in its two subsequent ships, Emerald Princess and Ruby Princess, and has retro-fitted this venue into several of its ships that entered service before Crown Princess. Grand Princess received her Crown Grill during the extensive renovations that were made to the ship in the Spring of 2011. All of the Crown Grills across the Princess fleet offer the same menus. They also have the same overall atmosphere of urban sophistication with dark wood paneling, black marble fireplaces and Tiffany-style fixtures giving off soft light.. Each has an open kitchen so that guests who are so inclined can see their meals being prepared. There are differences, however. The Crown Grill on Grand Princess is somewhat smaller than the one on Crown Princess. It is located forward of the atrium whereas on Crown Princess, the Crown Grill is well aft of the atrium. 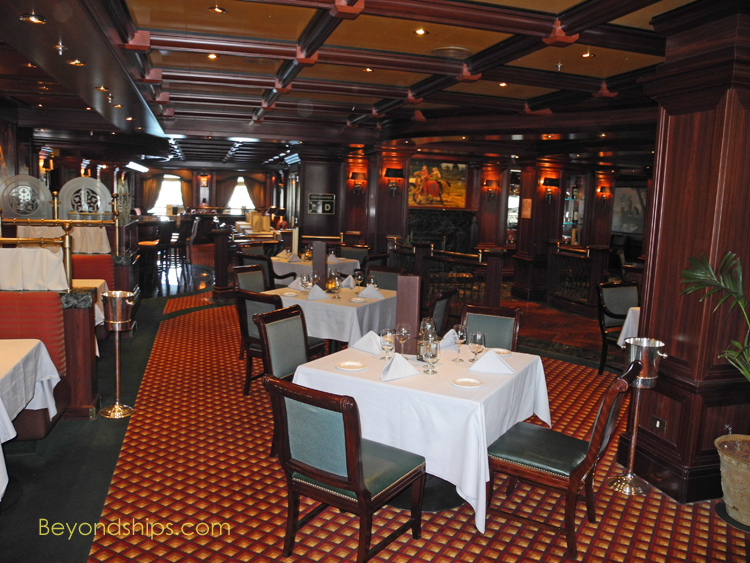 Also, whereas Crown Princess has Pre-Raphaelite style paintings of King Arthur, his knights and castles (apparently a reference to "crowns"), the Grand Princess has black and white photos of city scenes (a reference to the restaurant's New York City steakhouse atmosphere). Of course, even though the restaurants follow the same recipes and have the same standards, one has to expect some differences in the flavor of the food and in the service. Different people operate the venues on each ship. 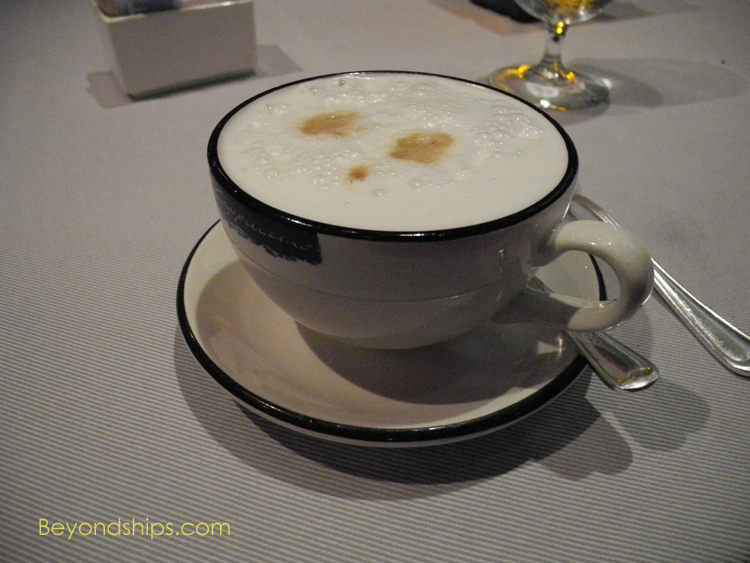 Still, I was only able to detect very minor differences between my experience at the Crown Grill on Grand Princess versus my experience on Crown Princess less than a week later. The Crown Grill is not merely a name change for the steakhouses Grand Princess and some of the other Princess ships had previously. The Crown Grill menu is more extensive and includes more seafood options. In addition, the atmosphere is more upscale and sophisticated. The dining experience in the Crown Grill begins in earnest when the server wheels over a cart with plastic-wrapped examples of the various cuts of meat that are listed on the menu. He or she then explains the character of each cut including tenderness and flavor. Suggestions are made (e.g., order Porterhouse medium rare so that the sirloin portion will be more tender) as are recommendations. Clearly, this approach to dining reflects respect for the guest. The restaurant is giving the guest more information than is on the menu. Implicit in doing this is an acknowledgment that the guest is intelligent enough to process this information and arrive at a better decision about what to order. It is a hallmark of a superior dining experience. In certain respects, the lobster cake starter is similar to a traditional crab cake. However, I found that the lobster cake had a more subtle flavor with less of a spicy punch than a crab cake. The light breaded crust was thin and crisp, not overcooked and not overpowering. A stronger appetizer is the sea scallops wrapped in bacon. Sea scallops can be rubbery if they are not prepared correctly. But the Crown Grill's version of this classic dish successfully avoided that pitfall. The scallops were tender and their mellowness contrasted nicely with the bite of the bacon, which was neither under-cooked nor charred. The star of the soup offerings is the Black and Blue Onion Soup. It is modeled after French onion soup. However, in place of the tradition Gruyere cheese, this soup arrives with a crust of blue cheese covering the top of the ceramic pot. Whereas the traditional soup uses beef stock, this soup is built upon chicken stock, the theory being that a combination of blue cheese and beef stock would be too heavy and would have a muddy flavor. Finally, in place of the wine used in the traditional soup, this soup uses Jack Daniel's whiskey. (The "black" in the soup's name is a reference to the color of the Jack Daniel's label). The soup arrives at the table very hot. While it is tempting to break through the cheese crust and start consuming the mixtures of breads, onions, cheese and soup immediately, it is much better to let it breathe for a few minutes. Only when it has cooled down somewhat can you taste the abundance of flavors. If you choose one of the meat dishes for your main course, the server will bring out a selection of steak knives for you to select from before bringing the main course to the table. He or she will impart some advice as to which knife best goes with the particular cut of meat that you have ordered. Still, the final choice of weapon is up to you. For the filet mignon (Crown Princess), a butter knife would have sufficed. It was tender and flavorful. With just a light demi-glaze sauce, it was delicious and had an array of flavors. It arrived cooked exactly as ordered. The Porterhouse steak (Grand Princess) required a heavier blade. Once again, the filet side of the steak was soft and tender. However, as is always the case with Porterhouse, the sirloin side put up more of a fight. The marbling in the sirloin, which produces the added flavor of this cut, also makes it more chewy. In such situations, the sauce takes on added importance. Both the demi-glaze and the Béarnaise sauce enhanced the flavor of the beef. Another welcome enhancement to the flavor was the three gourmet salts that the server had brought to the table. A slight sprinkle of any of these is all that is necessary to really bring out the flavor of the beef. The Hawaiian Black, with the look and texture of course ground pepper, had the strongest flavor. At the other end of the spectrum, the Himalayan Mountain Pink Salt had the finest texture. However, the one I enjoyed the most was the fragrant Smoked Applewood Salt because its smoky taste complemented the marbled sirloin. Although not listed on the menu, you can request to combine one of the beef dishes with the lobster main course to make a "Surf and Turf." My server brought the beef and the seafood on separate plates in order to keep the butter from the lobster from getting on the beef and the sauce from the steak getting on the lobster. This again shows respect for the guest’s dining experience. You are free, of course, to put them onto the same plate once they arrive if you want the combination of flavors. Instead of a single large lobster tail, I was served several medium-sized tails. As lobsters can become tough and less flavorful as they age, smaller tails are usually more tasty. In any event, these were full of flavor and quite tender. The Crown Grill offers an array of vegetable and potato side dishes. 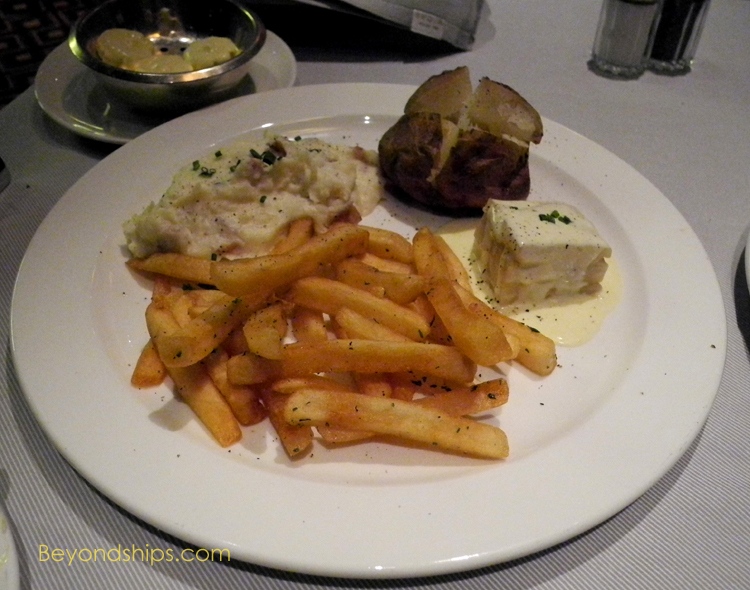 My servers on both Grand Princess and on Crown Princess recommended the scalloped potatoes. But, I preferred the red skin mashed potatoes as it did not compete with the main course for attention. I was most impressed by the corn casserole on Grand Princess but all of the vegetable dishes that I sampled on both ships were good. For dessert, the Crown Grill offers an array of options. Each is tempting so the sampler option, which includes all of the desserts except the Wild Berry and Apple Cobbler is a wise choice. The standout dessert, however, was the Chocolate Obsession. This is a fallen cake served soufflé-style with a molten interior of dark chocolate. A nice alternative is the cobbler. 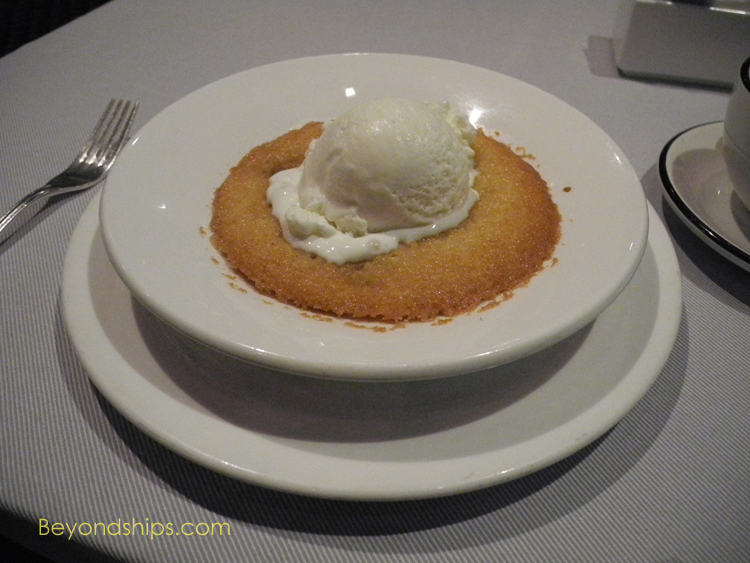 It does not contain as much fruit as a New England cobbler but the cake is tasty and contrasts well with the vanilla ice cream that sits atop the cobbler. 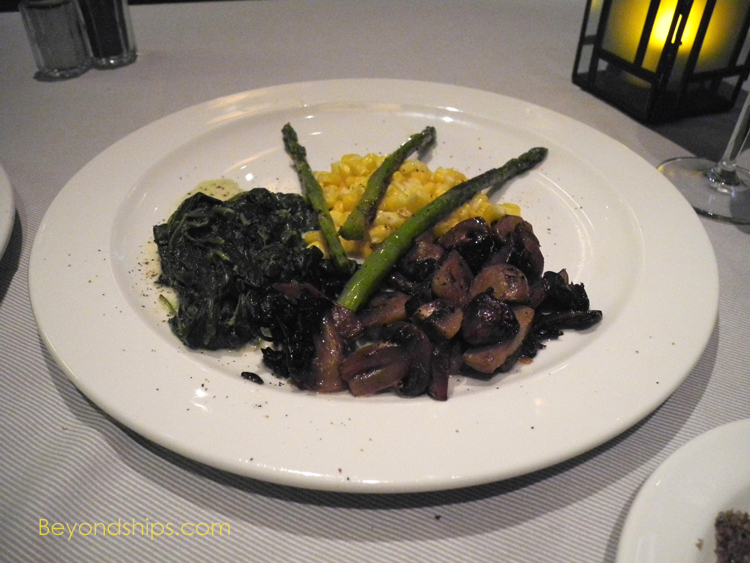 Click here for a review of Alfredo's Pizzeria on Grand Princess.